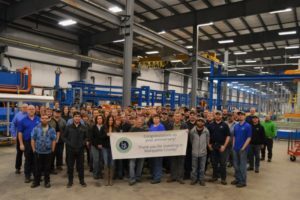 MARQUETTE- The Lake Superior Community Partnership (LSCP) assisted Superior Extrusion, Inc. (SEI) with a 20th anniversary celebration photo. For 20 years, SEI has been committed to providing customers the highest quality Aluminum Extrusions and related services that are on time, correct and complete. They focus on continuous improvement in their products, processes and procedures, they service the entire Central United States. This highly skilled work force focuses on teamwork, safety and quality, making them industry leaders. Community involvement is one of the core values at SEI. They continue to support local schools, businesses and a variety of Marquette County events. SEI’s goal is to pay it forward and strengthen the community. SEI is located at 118 Avenue G, in Gwinn. For more information you can visit their website at superiorextrusion.com or call 906.346.7308. Pictured: SEI Management and staff. MARQUETTE –The Lake Superior Community Partnership (LSCP) recently assisted U.P. Reef with their one year anniversary celebration. U.P. Reef is a full-service aquarium store with a wide array of products and expertise located in downtown Marquette. U.P. Reef specializes in helping customers create stunning saltwater aquariums that are full of life. The store carries saltwater fish, premixed saltwater, corals, and equipment that can help bring any aquarium to the next level. U.P. Reef can also assist customers with design, restoration, and local pickup/delivery services. U.P. Reef is located at 118 W. Washington St. #B (above Wattsson & Wattsson Jewelers), Marquette, MI. They are open Tuesday, Wednesday and Friday from 11:00 a.m. – 2:00 p.m. and 3:00 p.m. – 6:00 p.m. and Saturday from 10:00 a.m. – 1:00 p.m. You can also call (541) 968-1963 to set up an appointment or email upreef@gmail.com for more information. Pictured from left to right: Mary VanTilburg, LSCP Director of Business Development, Pete Frazier, Marquette City Commission, Candice, Cora, Adaleh and Jeff Larson, Owners, Dave Campana, Marquette City Commission and Emily Tardiff, LSCP Marketing Coordinator. 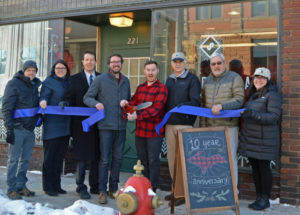 MARQUETTE- The Lake Superior Community Partnership (LSCP) recently assisted Superior Design with a ribbon cutting to celebrate the grand opening of their second location in downtown Marquette. Superior Design specializes in graphic design, printing, photography and videography. In-house they create stickers, signs, banners, window and wall graphics, wrapped canvases and vehicle graphic and wraps. 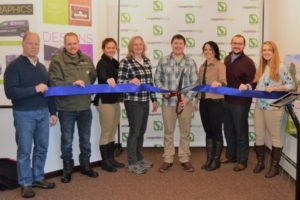 Superior Design’s second location is at 612 North Third Street in Marquette. They are open Tuesday-Friday from 10:00 a.m. – 5:00 p.m. For more information you can visit their website at www.upsuperiordesign.com or call (906) 204-2070. Pictured from left to right: Dave Campana, Marquette City Commission, Pete Frazier, Marquette City Commission, Tara Laase-McKinney, Marquette DDA, Jenn Hill, Marquette City Commission, Andy Ferns, Owner, Becky Salmon, Marquette DDA, Scott Knaffla, Marquette County Ambassador and Sara Sands LSCP Business Development Representative. MARQUETTE- The Lake Superior Community Partnership (LSCP) recently held a ribbon cutting with Garden Bouquet & Design to celebrate their name change to Northwoods Flora. Northwoods Flora is a floral studio and metaphysical shop located in downtown Marquette. They specialize in custom floral arrangements for everyday bouquets, weddings and events. Their design inspirations come from the Northwoods landscape and the waters of Lake Superior. They also carry houseplants, home goods and local art. You can find crystals, candles, oracle decks, spells, ritual oils and wands there as well! Northwoods Flora is located at 130 W. Baraga Avenue and is open on Monday’s from 10:00 a.m. – 4:00 p.m., Tuesday-Friday from 9:00 a.m. – 6:00 p.m. and Saturday from 10:00 a.m. – 4:00 p.m. For more information you can visit their website at www.northwoodsflora.com or call 906.225.5020. Pictured from left to right: Dave Campana, Marquette City Commission, Jenn Hill, Marquette City Commission, Fred Stonehouse, Marquette City Mayor, Maggie Finwall, Owner, Donald Finwall, Owner, Kathryn Lakanen, Manager and Sara Sands, LSCP Business Development Representative. MARQUETTE- The Lake Superior Community Partnership (LSCP) recently assisted The Crib with a ribbon cutting to celebrate their new store opening. The coffeehouse is located at 401 N. Third Street in Marquette. The Crib is run by the producers of Crappie Coffee, a Marquette based coffee roasting business focused on producing high quality coffee that you can feel good about. The coffeehouse will offer retail bulk and bagged coffee and will be serving espresso drinks, pour over specialty coffees, and drip coffee all from the beans they roast. They will also have tea, hot cocoa and baked goods. The Crib is open seven days a week from 7:00 a.m. – 7:00 p.m. You can follow them on Instagram at @thecribmqt. You can also find their products locally at Tadych’s Econo Foods, Marquette Food Co-op, Spice Merchants, the Neighborhood Spot and Yooptone. 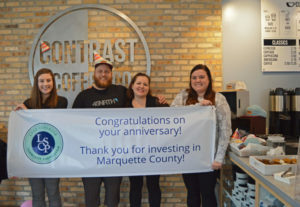 Pictured from left to right front row: Pete Frazier, Marquette City Commission, Dylan Trost, Roaster/Barista, Dave Grant, Owner, Nicole Alexander, Owner, Emily Wegemer, General Manager, Fred Stone House, Marquette City Mayor. Pictured from left to right back row: Brooke Quinn, LSCP Business Development Representative, Trish Davis, Marquette County Ambassador, Dave Campana, Marquette City Commission, Mona Lang, Downtown Development Authority and Jenna Smith, Marquette City Commission. MARQUETTE- The Lake Superior Community Partnership (LSCP) recently joined American Nameplate to celebrate their 40th Anniversary. For 40 years, American Nameplate has been committed to customer service with satisfaction guaranteed. They have been family owned and operated for three generations by retired military veterans. For the past 20 years it has been operated by Shawn and Barb Carver. American Nameplate specializes in custom awards, engraving, gifts, trophies and plaques. They provide many services including academic, corporate and sports awards, nameplates, nametags and small signs, glass, leather, metal, plastic and wood laser engraving. They can also provide cast bronze memorial plaques, advertising specialties and engrave your own items. They are located at 2292 U.S. Highway 41 West in Marquette and are open Monday-Friday from 9:30 a.m. until 5:30 p.m. For more information you can visit their website at www.americannameplate.net. Pictured from left to right: Scott Knaffla, Marquette County Ambassador, Shawn and Barb Carver, Owners and Kennan Marana, LSCP Membership Coordinator. The Contrast Marquette 1st Birthday Bash, took place Tuesday, October 30 from 6 a.m.-9 p.m. Drink specials and freebies were available to all customers! Contrast Coffee works closely with their wholesale partners to provide their customers with high quality, freshly roasted, specialty grade coffee. Check out their three other U.P. locations in Ironwood, Iron River and Iron Mountain. You can find Contrast Coffee on Facebook, Twitter and Instagram. For more information, visit their website at http://contrastcoffeeco.com/ or call 906-367-6137. The store is open from 6 a.m. – 9 p.m. everyday. Pictured left to right: Emily Tardiff, LSCP Marketing Coordinator, Alex Fields, Assistant Manager, Mandy Anglen, General Manager, Kennan Marana, LSCP Membership and Administration Coordinator. 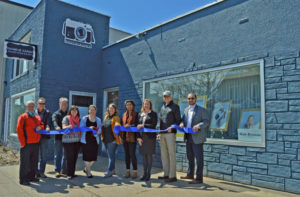 MARQUETTE – The Lake Superior Community Partnership (LSCP) recently teamed up with Tapio to celebrate the opening of their new storefront, located at 420 N. 3rd Street. Tapio is a showroom and retail space, showcasing interior design concepts and handmade wood furnishings crafted by local artist and carpenter, Hans Gottsacker. Tapio focuses on custom built-ins, case-goods, molding, paneling, and trim work. Gottsacker has worked in the trades for the last 10 years, has a Bachelor of Fine Arts in Woodworking and Furniture design from NMU, and a Masters of Fine Arts from the University of Wisconsin-Madison. He currently teaches as adjunct faculty in the Art Department at NMU. Tapio also serves as the studio and retail space to local silversmith, Emerson Graves and her business, Adorned Smithing Co. Adorned Smithing Co. is a handmade jewelry shop owned and solely crafted by Emerson Graves. The pieces created are with carefully curated stones set into contemporary designs inspired by southwestern patterns. Customers will be able to purchase and place custom orders for both Adorned Smithing Co. products, as well as, furniture and lighting by Tapio. Customers will also be able to view kitchen, bath, living room, and bar concepts within the conservatively sized space of only 300 sq. ft.
Hans Gottsacker will be available for contact in the consultation of residential design/build projects and can be reached at (920) 973-7333 or hansgottsacker@gmail.com. You can also find them on Instagram @Tapioshop. Emerson Graves will be the primary contact in the store, where she will be actively producing new jewelry in her studio and can be reached at AdornedSmithingCo@gmail.com. You can also find them on Instagram @AdornedSmithingCo. The store is open from 11 a.m.- 7 p.m. Tuesday-Thursday and 10 a.m.- 6 p.m. Friday- Saturday. Pictured left to right: Mary VanTilburg, LSCP Director of Business Development, Tiina Harris, City of Marquette Arts and Culture Center, Dave Campana, Marquette City Mayor, Fred Stonehouse, Marquette City Commission, Emerson Graves, Owner of Adorned Smithing Co., Hans Gottsacker, Owner of Tapio, Pete Frazier, Marquette City Commission, Tony Retaskie, Marquette County Ambassador. 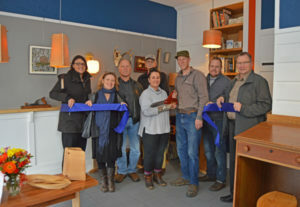 MARQUETTE – The Lake Superior Community Partnership (LSCP) recently assisted Madgoodies Studio with a ribbon cutting to celebrate their new store opening. The store is located at 209 W. Ohio Street. Madgoodies will be hosting their grand opening next Thursday, November 1st from 4 – 7 p.m. The Burger Bus will be outside at 5 p.m.
Madgoodies is a metals studio with an art gallery. Madeline Goodman, store owner, displays her work along with many other artists’, some being current Northern Michigan University students or Northern Michigan University alumni. “I am excited to give other artists a chance to show their work and to help them grow as artists. I have a great group in the shop and am very proud of all them! Please come by the shop and say hi,” says Madeline Goodman, store owner. You can find Madgoodies Studio on Facebook and Instagram. The store is open from 10 a.m.- 6 p.m. Tuesday-Thursday and 10 a.m.- 4 p.m. Friday and Saturday. Pictured left to right: Mona Lang, Marquette County Ambassador, Scott Erbisch, Marquette County Ambassador, Emily Tobin, Artist, Dave Campana, Marquette City Mayor, Maddie Pederson, Artist, Madeline Goodman, Madgoodies Owner/Artist, Logan Lehmann, Artist, Alex Kofsky, Accelerate UP, Fred Stonehouse, Marquette City Commission, Lance Wolfe, Small Business Development Center. 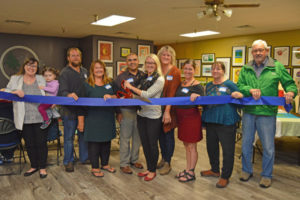 MARQUETTE- The Lake Superior Community Partnership (LSCP) recently held a ribbon cutting ceremony with Superior Culture to celebrate the opening of their new storefront. Superior Culture is known for brewing local kombucha. However, they are now serving beer and cider as well! Organic tea and sugar are added to a symbiotic culture of bacteria and yeast to produce a one-of-a-kind beverage known as kombucha. All beverages are flavored with freshly pressed fruit juice, herbs, and spices sourced as locally as possible. Their products are fermented in small batches using glass and oak barrels, never plastic. Superior Culture is located at 717 N 3rd Street in Marquette, MI. Contact them at 248-977-8838 or visit their Facebook page for more information. Pictured from left to right: John Marshall, Marquette County Ambassador, Tara Laase-McKinney, Marquette DDA, Harleigh Schumacker, Local Artist, Alex Rowland, Superior Culture Owner, Alex Kofsky, Accelerate UP, Pete Frazier, Marquette City Commission and Dennis West, Marquette County Ambassador. 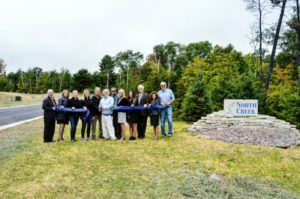 MARQUETTE- The Lake Superior Community Partnership (LSCP) recently held a ribbon cutting ceremony with Harbour View Development Corporation to celebrate the opening of Marquette’s newest residential community, North Creek at Harlow Farms. North Creek is a Site Condominium Subdivision in the City of Marquette offering 30 single family homesites. These beautiful homesites offer all underground utilities, natural gas and city plowed streets. The First Phase of 20 homesites is now complete and ready for lot purchases, and new home building. “North Creek is the final opportunity for Homeowners to purchase homesites in Harlow Farms Conservation Community “according to LR Swadley, Community Developer. “Buyers can choose from many beautiful wooded lots, next to our conservation areas, some with lake views, and all having access to the great trail system and community features Harlow Farms has to offer. Buyers can also choose their own builder with no restrictions on when they have to build. Interested buyers should contact L.R. Swadley at 906.250.2427 for a personal showing of these homesites. Harbour View Development Corporation is located at 501 Horizons Drive in Marquette and can be contacted at 906.631.7094 or visit their website www.swadleydevelopment.com. Pictured from left to right: Randy Larson, Marquette County Ambassador, Michelle Sellers, Marquette County Ambassador, Laura Swadley, Swadley Development Finance Manager, Erin Swadley, Sunrise Builders Project Manager, Dave Campana, Marquette City Mayor, Lynn Swadley Harbour View Development President, Pete Frazier, Marquette City Commissioner, Roxanne Daust, Marquette County Ambassador, Nicole Weldum, Swadley Development Sales & Marketing Manager, Mike Angeli, Marquette City Manager, Kristy Sibilsky, Range Bank Senior Vice President of Business Banking and John Marshall, Marquette County Ambassador. 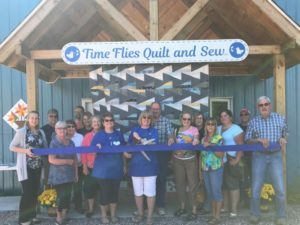 NEGAUNEE- The Lake Superior Community Partnership (LSCP) recently held a ribbon cutting ceremony with Time Flies Quilt and Sew LLC to celebrate their grand opening. Time Flies Quilt and Sew is unique because it offers personalized classes on how to use APQS longarm machines and customers can rent time to complete their own quilts. Services also include sales of the machines for those who wish to own one and also quilting for hire. Both Pam and her husband, Rick, are Certified Technicians so they are very familiar with the mechanics of the machines. APQS machines have a lifetime warranty from the company. An expansion to the studio is in the works for the BERNINA Creative Learning Center. Pam is the only BERNINA dealer in the U.P. and will feature two certified BERNINA technicians that will provide services to customers. The Creative Learning Center will be classroom style and will feature education and events. Pictured from left to right: Sara Sands, LSCP Business Development Representative, Mick Johnson, Diana Johnson, Mike Kumpula, Julie Johnson, Brooke Ollanketo, Lorraine Johnson, Julie Nault, Pam & Rick Kaupilla, Owners, Christine Sweanor, Teresa Zelinski, Bev Hill, Brandy Thomas, Mike Ervasti and John Marshall, Marquette County Ambassador. 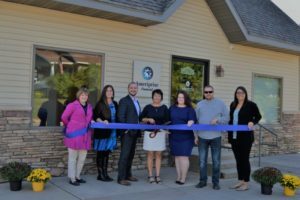 MARQUETTE- The Lake Superior Community Partnership (LSCP) recently held a ribbon cutting with Barton, Knaffla & Associates to celebrate their name change to Flourish Financial Partners. Barton, Knaffla & Associates a private wealth advisory practice of Ameriprise Financial Services, Inc. recently changed the name of their practice to Flourish Financial Partners, a private wealth advisory practice of Ameriprise Financial Services, Inc. at 1501 Division St. in Marquette. As a private wealth advisory practice, Flourish Financial Partners provides financial advice that is anchored in a solid understanding of client needs and expectations, and provided in one-on-one relationships with their clients. For more information, please contact Angela Abbott at 906.226.7526. Pictured from left to right: Amy Clickner, Marquette County Ambassador, Angela Abbott, Marketing Manager, Scott Knaffla, Financial Advisor, Patricia Barton, Private Wealth Advisor, Pete Frazier, Marquette City Commission and Mary VanTilburg, LSCP Director of Economic Development. 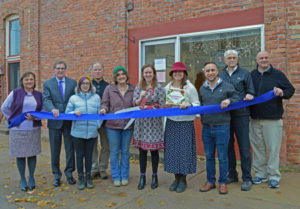 MARQUETTE- The Lake Superior Community Partnership (LSCP) recently held a ribbon cutting ceremony with Hiawatha Music Co-Op to celebrate the grand opening of their new office. The Hiawatha Music Co-op has been bringing traditional music events to the Marquette area for 40 years. In addition to the annual Festival held at Tourist Park each July, the Co-op hosts ten or more other music events during the year. In its fifth year, they host a monthly concert series January through May on the third Wednesday of each month. This series, called Hiawatha on TAAP or traditional acoustic arts performance, highlights the variety of music that traditional music offers such as Irish, Cajun, old timey, blues, bluegrass, and folk singer/songwriters. The Co-op also partners with other community businesses and organizations hosting cooperative performance events with Peter White Public Library, Blackrocks Brewery, Ore Dock Brewing Company and the City of Marquette Arts and Culture Center. They are now located at 1015 N. Third Street #9 in Marquette. They are open Tuesday and Wednesday, 12 to 6 P.M. For more information please contact them at 906-226-8575 or info@hiawathamusic.org. 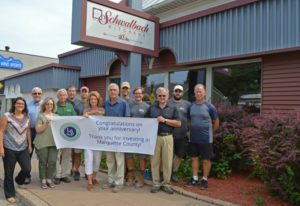 MARQUETTE- The Lake Superior Community Partnership (LSCP) recently held an anniversary celebration with Schwalbach Kitchen in honor of their 40th Anniversary. Located on Third Street in Marquette’s Downtown District, Schwalbach’s has been in the business of making your house a home for the last 40 years. Although centered within the Marquette Community, Schwalbach’s designs can be seen throughout the Upper Peninsula and neighboring regions. Starting up in 1978, Schwalbach knew the importance of not only creating kitchens but also creating spaces that would bring everyone together. Not only do they offer complete design services, the company prides themselves on being able to walk you through a do it yourself project, on your next kitchen, bath, laundry room, entertainment center or even organizing your closets. Completing thousands of kitchen and bathroom remodels over the years, Schwalbach brought back the most memorable on their social media to honor its 40 years in business. Launching the ThrowBACH Thursday on Facebook, Schwalbach Kitchens takes us on a journey of the greatest 80s, 90s and early 2000s bath and kitchen remodels. Giving us all a good laugh and a great reminder of the importance of good food and great kitchens. Schwalbach Kitchen is located at 500 N. Third Street in Marquette. Their hours are 8:00a.m. – 5:30 p.m. daily. For more information you can visit www.schwalbachs.com or call (906)-228-3232. NEGAUNEE TOWNSHIP ­– Leaders of the Michigan Statewide Carpenters and Millwrights Joint Apprenticeship and Training Fund announced today at a groundbreaking ceremony in Negaunee Township that a state-of-the-art, 30,000 square foot training facility to train and educate the next generation of skilled tradesmen and women is planned to open next year. According to a national report, 60 percent of contractors had trouble finding skilled workers in the last year. Construction will continue to be a top job provider in the state of Michigan through 2019, the University of Michigan’s RSQE forecast predicted last October. The new training facility will include specially-designed indoor areas for carpenters and millwrights to gain real-world experience, in addition, allowing union members to practice skills that are used to build everything from single-family homes to medical centers, bridges and schools. The center will also contain areas for woodshop training and welding booths to help members hone specialized skills. The facility will focus on cross-training between carpenters and millwrights, equipping workers with unique skills and helping them take on complex projects. 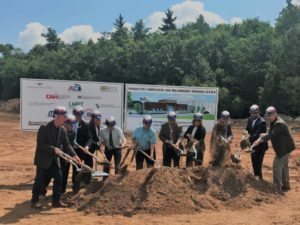 “This new training center will provide tremendous opportunity for every carpenter and millwright in our union, whether they are just starting out as an apprentice or a seasoned worker seeking professional development,” said MRCC Organizing Director Kevin Klingler. Klingler also noted apprentices can “earn while they learn,” meaning they earn money while working towards a rewarding career in the skilled trades as a carpenter or millwright. Construction for the new facility is projected to take one year to complete. For more information, contact Jen McKernan at (313) 618-5022. GWINN- The Lake Superior Community Partnership (LSCP) recently held an anniversary celebration with Boreal Aviation, Inc. (BAI) in honor of their 20th Anniversary. Boreal Aviation, Inc. technicians have over 55 years of combined experience specializing in aircraft services, calibrations, and aircraft maintenance. Boreal also staffs a FAA certified mechanic for aircraft maintenance issues or questions. They provide aircraft services with over ten acres of ramp space. In addition to providing aircraft services they house two calibration labs for aircraft and commercial precision measurement equipment. Their mission is to be the leading provider of aircraft services, maintenance, repair, and calibration. BAI is located at 401 Ave F in Gwinn. Their hours are 8:30 a.m. – 8:30 p.m. daily. For more information you can visit www.borealaviation.com or call (906) 346-6440. Pictured from left to right: Jesse Bell, Marquette County Ambassador, Karen Anderson, Marquette County Ambassador, Todd Lundstrom, Assistant Line Service Supervisor, Larry Schaefer, Line Service Technician, Chelsea Hennessey, Office Manager, Ed Glasgow, Line Service Supervisor, Tom Cline, COO, Mike McNeil, Director of Operations, Scott Erbisch, Marquette County Ambassador, Johnny DePetro, Marquette County Commissioner, John Marshall, Marquette County Ambassador and Mary VanTilburg, LSCP Director of Economic Development. 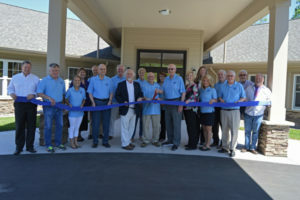 GWINN- The Lake Superior Community Partnership (LSCP) recently held a ribbon cutting ceremony with Our Grille to celebrate the grand opening of their new location. Our Grille, owned by Renee Rushlow and Michelle Ford-Thompson, is a restaurant and bakery that aims to provide fresh, quality food to the area. They built their reputation on their cakes, cupcakes, and desserts, and have now become a restaurant that serves a full menu of homemade soups, fresh salads, and sandwiches, as well as homemade sweets and treats. They are now located at 97 State Highway M-35 in Gwinn. They are open Monday – Wednesday 7:00 a.m. – 8:00 p.m., Thursday – Saturday 7:00 a.m. – 10:00 p.m., and on Sunday from 9:00 a.m. – 2:00 p.m. For more information please contact them at (906) 372-4003 or find them on Facebook. Pictured from left to right: Michelle Sellers, Marquette County Ambassador, Brooke Quinn, Lake Superior Community Partnership- Business Development Representative, Brooke Wiertella, Connie Forress, Chris Golay, Kelsey Moreau, Alec Mayo, Ed Wasey, Klaye Olson, Restaurant Manager, Scott Olson, Renee Rushlow, Owner, Libbi Olson, Athena Meyers, Jessica Bouford, Kris Pazolt, Dilon Wiertella, and Keith Moyle, Marquette County Ambassador. 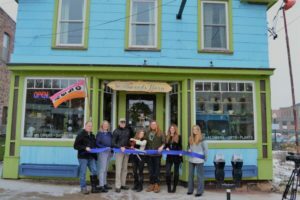 MARQUETTE- The Lake Superior Community Partnership (LSCP) recently held a ribbon cutting ceremony with Sayklly’s The Candy Store to kick off their grand opening. 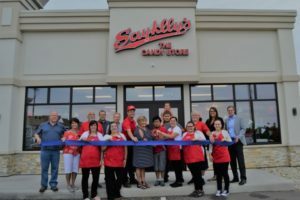 The owners, Julie and Kevin Robitaille, of the Sayklly’s Factory in Escanaba recently opened the new store Sayklly’s The Candy Store in Marquette in the Jandron Retail Center. They will be hosting a grand opening event Saturday, July 21 at 10 a.m. where great deals, giveaways, and more will be happening! Sayklly’s Candies has been a family owned and operated business since 1906. 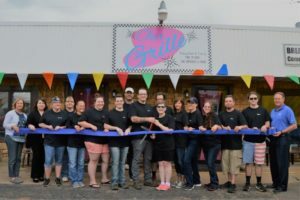 Owner, Kevin Robitaille has been a member of the Sayklly’s team for 30 years. They will continue to sell their local homemade and hand dipped chocolates, gummies, jelly beans, and more. Sayklly’s The Candy Store is located at 609 County Road HQ in Marquette near Target. Their hours are Monday-Friday 10 a.m. – 7 p.m., Saturday 10 a.m. – 5p.m., and closed on Sunday. For more information please contact them at (906) 273-2595 or find them on Facebook. Pictured from left to right front row: Lori Seguin, Sayklly’s Staff; Libbie Trill, Syklly’s Staff; Julie Robitaille, Owner; Eli Tatrow; Ellie Soper, Manager; Lucy Snyder, Sayklly’s Staff and Sabrina Stanley, Sayklly’s Staff.Pictured from left to right back row: Dave Aro, Marquette County Ambassador; Barb LaVigne; Garland LaVigne; Pete Frazier, Marquette City Commission; Randy Girard, Marquette Township; Kevin Robitaille, Owner; William Soper; Vanessa Soper; Dan Robitaille; Mary VanTilburg, Lake Superior Community Partnership, Director of Business Development and Scott Erbisch, Marquette County Ambassador. 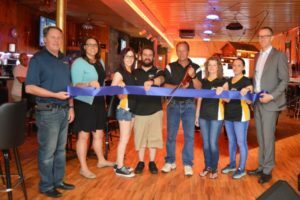 ISHPEMING- The Lake Superior Community Partnership (LSCP) recently held a ribbon cutting ceremony with The Royal Pub to kick off their grand opening weekend. The Royal Pub will be hosting their grand opening on June 30 from 2 p.m. – 2 a.m. Come enjoy great music, drink specials, and good company! Bands will be starting at 2 p.m. and raffles for door prizes will be held hourly. Gather up your friends and make sure to come and see the transformation of their new bar! The Royal Pub is located at 205 East Division Street in Ishpeming. They are bringing back the past with pool, darts, drinks, and food. They are open Monday-Saturday from 5 p.m. – 2 a.m. and on Sundays from 12 p.m. – 2:00 a.m. For more information please contact (906) 486-4505 or find them on Facebook. 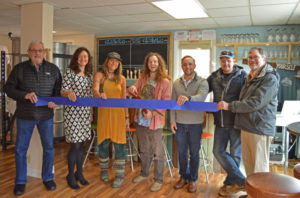 Pictured from left to right: Keith Moyle, Marquette County Ambassador; Mary VanTilburg, Business Development Specialist, Lake Superior Community Partnership; Sierra Scarfo, Bartender; Brandon Scarfo, Manager; Tom Auston, Owner; Karen Auston, Owner; Candace Norem, Bartender; and Jesse Bell, Marquette County Ambassador. 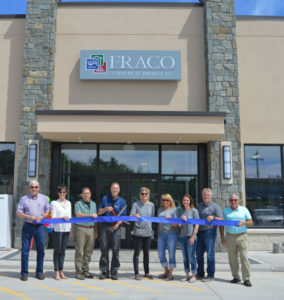 MARQUETTE- The Lake Superior Community Partnership (LSCP) recently held a ribbon cutting ceremony with Fraco Concrete Products to celebrate the opening of their new showroom. For over 60 years they have been producing and supplying the highest quality in masonry and landscape products for both contractors and homeowners. They are the Upper Peninsula’s leading supplier for concrete block, redi-mix, tile, landscaping products, and masonry supplies. Fraco Concrete Products offer a wide variety of construction materials and accessories for starting a new job, maintenance, or repair. Stop by their showroom Monday-Friday from 8 a.m. – 6 p.m. and Saturday from 9 a.m. – 3 p.m. located at 3470 US Highway 41 West in Marquette. For more information visit www.fracoinc.com or call 906-249-1476. 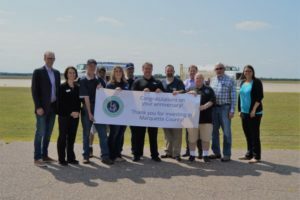 Pictured from left to right: John Marshall, Marquette County Ambassador; Heather Mosher, Marquette County Ambassador; Mike Cousineau, Sales; Lincoln Frazier, President; Terrell Frazier; Chris Richards, Sales; Missy Bengry, Office Manager; Terry Bengry, Operations Manager and Paul Wolfson, Marquette County Ambassador. 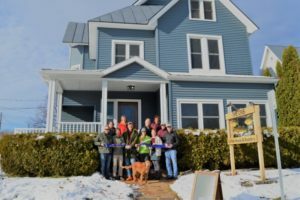 MARQUETTE- The Lake Superior Community Partnership (LSCP) recently held a ribbon cutting ceremony with the Trillium House to celebrate the completion of their construction at 1144 Northland Drive. Guests had the ability to take tours, listen to a presentation, and enjoy refreshments. The mission of the Trillium House is to build and support a residence for individuals to live in during their final weeks and months, while under the care of Hospice. At the Trillium House the residents and their loved ones are considered family, there is tons of natural light and nature right at hand. The space is filled with warm smiles and a staff that will do whatever they can to comfort those who live there. The Trillium House is still in need of many things. Please consider making a donation to help make it a home for their residents. For more information you can visit www.trilliumhospicehouse.org or call 906-264-5026. Pictured from left to right front row: Tony Retaskie, Marquette County Ambassador; Sam Elder, Board Member; Sharon Fries, Vice President; Dave Holli, Board Member; Lyn Swadley, Project Manager; Aaron Scholnik, President; Dan Mazzuchi, Board Member; Alicia Burgess, House Manager; Jackie Martin, Treasurer; Bob Kulischek, Board Member and Dave Aro, Marquette County Ambassador. Pictured from left to right back row: Sherry Henderson, Board Member; Pat Bray, Executive Director; Roger Bentlage, Board Member; Mary Bentlage, Volunteer; Sue Kitti, Treasurer; Trish Davis, Marquette County Ambassador; Tom Blake, Board Member and John Marshall, Marquette County Ambassador. 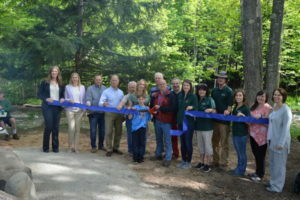 MARQUETTE- The Lake Superior Community Partnership (LSCP) recently held a ribbon cutting ceremony with Rippling River Resort & Campground to celebrate their grand opening. Guests had the ability to take self-guided tours and enjoy a traditional camp cookout with live music by Troy Graham. Rippling River Resort & Campground is located on over 37 acres just minutes from downtown Marquette on the Carp River. They provide options for all types of campers, from rustic tent sites to luxury log cabins. You can access mountain biking and hiking trails within the Resort grounds, ski at Marquette Mountain, or relax in the sun down by the river. Rippling River Resort & Campground also provides many amenities including a heated pool (seasonal), year round outdoor hot tub, complimentary WIFI, a general store, a playground, and much more! For more information or to make a reservation call 906-273-2259 or visit their website at http://www.ripplingriverresort.com/. Pictured from left to right: Patricia Davis, Marquette County Ambassador; Melissa Holmquist, Marquette County Ambassador; Pete Frazier, Marquette City Commissioner; Dave Campana, Marquette City Mayor; Greg Dix, 41 Lumber; Melissa Curran, Owner; Logan Curran; Mark Curran, Owner; Gary Bufe, Hiawatha Log Homes; Joe Esbrook, Hiawatha Log Homes; Joanna Emigh, Campground Manager; Toni Olavaime, Campground Staff; Cole Mulder, Campground Staff; Sierra Schiller, Campground Staff; Jenna Smith, Marquette City Commissioner; and Karen Anderson, Marquette County Ambassador. 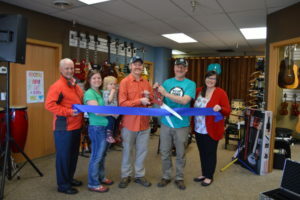 MARQUETTE – The Lake Superior Community Partnership (LSCP) recently teamed up with Yooptone Music to celebrate the grand opening of their new location with a ribbon-cutting. The owners are excited to offer a variety of musical options to current and aspiring musicians at the new store. Yooptone Music is owned and operated by local musicians Jake Kuhlman and Jeff Krebs, who have over 25 combined years of professional music experience. They started the business with one goal in mind, which is to better serve their community’s musicians and to foster growth so that they can pass along the gift of music to the next generations. Yooptone Music plans to achieve this goal by offering a full line of instruments, accessories, sound gear, professional repairs, rentals, and quality music lessons for all ages and skill levels. Yooptone Music is located at 1015 N. Third Street, Marquette, MI, in the Village Shopping Center. They are open Monday – Thursday from 11:00 a.m. – 8:00 p.m., Friday from 11:00 a.m. – 6:00 p.m., and Saturday from 11:00 a.m. – 5:00 p.m. For more information, call (906) 273-0568 or visit www.yooptone.com. Pictured from left to right: Rand Larson, Marquette County Ambassador; Melissa Kuhlman; Eleanor Kuhlman; Jake Kuhlman, Owner; Jeff Krebs, Owner and Jenna Smith, Marquette City Commissioner. 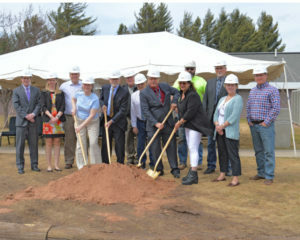 ISHPEMING – The Lake Superior Community Partnership (LSCP) recently teamed up with the Marquette County Medical Care Facility (MCMCF) for a groundbreaking ceremony to celebrate the construction of its new Rehab Wing. They are excited to expand their operations to better serve the needs of their current and future residents. MCMCF is a skilled nursing facility that services residents of all ages and is equipped to handle a wide variety of medical needs. MCMCF is also able to provide special services to those in need of physical, occupational, and speech therapy. The facility’s goal is to create a home-like atmosphere and provide the best care for its residents. The Marquette County Medical Care Facility is located at 200 Saginaw St in Ishpeming. To learn more about the facility and services offered, visit www.mqtcmcf.org or call (906) 485-1061. Pictured from left to right: Scott Erbisch, Marquette County Administrator; Melissa Holmquist, Marquette County Ambassador; Mark Eckles, Plante Moran; Caroline Bridges, DHHS Board Chair; Bradley Cory, DHHS Board Member; Mark Sundquist, Cross Construction; Gerry Corkin, Marquette County Board Chair; Jerry Hubbard, Building Administrator; Cindy D’Agistino, DHHS Board Member; Mike Patron, Cross Construction; Steve Boetcher, Integrated Designs, Inc.; Karen Alholm, Marquette County Commissioner and John Wright, Cross Consturction. 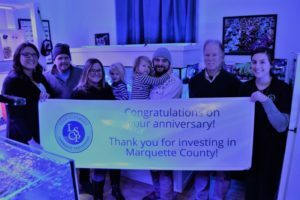 MARQUETTE- The Lake Superior Community Partnership (LSCP) recently held a ribbon cutting ceremony with Daniele Carol, Co. to celebrate one year at their studio in downtown Marquette. Owner and lead photographer, Daniele Carol, started 14 years ago and she and her team have a wide range of skills that covers newborn photography, to professional business portraits for large corporations. Daniele believes the gift of photography is a beautiful thing and their goal is capture history as it happens, and fill the walls of their client’s homes with beautiful portraits that will last a lifetime. Daniele Carol, Co. is located at 617 N. Third Street in Marquette, MI. Contact Daniele at 906-228-9636 or visit their website at http://www.danielecarol.com/ for more information. Pictured from left to right: Randy Larson, Marquette County Ambassador; Pete Frazier, Marquette City Commission; Dave Campana, City of Marquette Mayor; Jenna Smith, Marquette City Commission; Daniele Carol, Owner/Lead Photographer; Ashley Sarri, Production Manager; Lali Khalid, Production Assistant; Michelle Sellers, Marquette County Ambassador; Fred Stonehouse, Marquette City Commission; Scott Knaffla, Marquette County Ambassador. 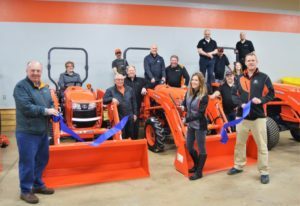 MARQUETTE – The Lake Superior Community Partnership (LSCP) recently teamed up with UP Kubota to celebrate the grand opening of its new location on US-41 and its new ownership with a ribbon-cutting. During the two-day grand opening, attendees have the opportunity to demo tractors, RTVs, zero-turn mowers, enjoy refreshments, and enter prize drawings. Guests can also take advantage of special blowout pricing. The event will be held on Friday, April 13 from 8:00 a.m. – 5:00 p.m. and Saturday, April 14 from 10:00 a.m. – 2:00 p.m. Located on 4250 US HWY 41 West, in Marquette, MI, UP Kubota carries utility vehicles, mowers, tractors, construction equipment, generators, and other power equipment. The business also repairs and services tractors and equipment. UP Kubota is open Monday – Friday from 8:00 a.m. – 5:30 p.m. and Saturday from 8:00 a.m. – 12:00 p.m. They can be reached at (906) 451-5700 or at www.upkubota.com. Pictured: Jim Grundstrom, President of Frei Chevrolet; Paul Wolfson, Marquette County Ambassador; Matt Iery, UP Kubota Technician; Todd Noordyk, Great Lakes Radio CEO; Sean McAdam, UP Kubota GM; Paul Gray, UP Kubota Sales; Nick Toutant, UP Kubota Technician; Brian Wiggins, UP Kubota Parts; Jackie Paupore, UP Kubota Marketing; Ryan Blixt, UP Kubota Sales and Sarah & Jordan Wolfenberg, UP Kubota Owners. 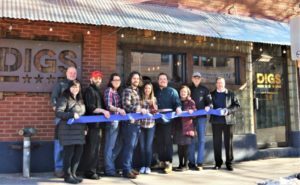 MARQUETTE – The Lake Superior Community Partnership (LSCP) recently teamed up with DIGS Gastropub to celebrate its one-year anniversary with a ribbon cutting ceremony. DIGS will continue its anniversary celebration on Saturday, March 17 with the second annual DIGS Bash, a back-alley festival. DIGS Gastropub, founded in 2017, provides guests with fun, delicious spins on American pub food, creative cocktails, and exclusive beer options in a warm, inviting atmosphere. The eatery has also developed a following for its catering services. After just a year, DIGS has become a staple in downtown Marquette’s restaurant scene. DIGS Bash 2018 (which will also celebrate St. Patrick’s Day) will take place from 11:00 a.m. to 2:00 a.m. at DIGS Gastropub, located at 154 W Washington St in downtown Marquette. The event will feature free admission, live music, green beer, corned beef and cabbage. The back alley and parking lots behind DIGS will be blocked off and tented for the event. Guests must be 21 or older to attend. For more information, visit DIGS’ Facebook page at www.facebook.com/DIGSMarquette or call (906) 226-6399. Pictured from left to right: Paul Schloegel, Marquette City Commissioner; Jenna Smith, Marquette City Commissioner; Andrew Sear, DIGS Executive Chef; Lauren Moosman, DIGS Manager; Pat Digneit, DIGS Owner; Alyssa Pilot, DIGS Owner/General Manager; Chad Linton, DIGS Manager; Mona Lang, DDA Executive Director and Marquette County Ambassador; Fred Stonehouse, Marquette City Mayor Pro Tem, and Tony Retaskie, Marquette County Ambassador. 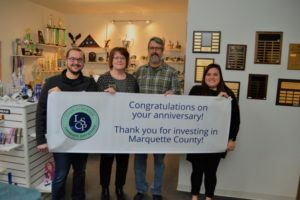 MARQUETTE- Integrated Designs, Inc. (IDI) recently teamed up with the Lake Superior Community Partnership (LSCP) to celebrate their 25th anniversary. 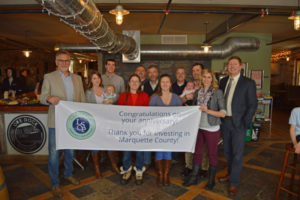 To celebrate this milestone they hosted local clientele, business affiliates, friends and family at the Ore Dock Brewing Company on Friday, February 23rd. IDI was established in 1993 with a primary mission to deliver quality, cost effect design solutions, responsive to each individual client’s needs. IDI provides creative and practical design solutions while maintaining program efficiency, technical proficiency and cost effectiveness. IDI is a full service design organization qualified to manage a variety of planning, design and construction administration work related to new construction, renovations and repairs. For more information on Integrated Designs, Inc., visit their website at www.http://intdesigns.com/ or call 906.228.4480. Pictured from left to right: Steve Boettcher, Mechanical Engineer/Principal; Shannon Finnila, Business Manager; Andrew Farron, Mechanical Engineer; Amy Doveau, Mechanical Engineer; Tom Heiskanen, Electrical Designer; Sean LaRock, Associate/Architect; Aurora Dobbs, Mechanical Engineer; Andrew Mansfield, Civil Engineer; Travis Hongisto, Associate/Architect; Carrie Goodney, Designer and Phil Niemi, Structural Engineer/Principal. 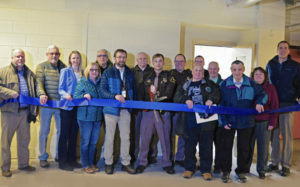 MARQUETTE-The Marquette County Sheriff’s Office, the County of Marquette, and Pathways Community Mental Health teamed up with Lake Superior Community Partnership (LSCP) to celebrate the opening of two diversion rooms with a ribbon cutting ceremony. This is part of their joint Jail Diversion project. Pictured from left to right: Dave Aro, Marquette County Ambassador; John Marshall, Marquette County Ambassador; Melissa Holmquist, Marquette County Ambassador; John Blemberg, CFO of Pathways Community Mental Health; Tami Leblanc, Jail Diversion Liaison; Lynn Johnson, Pathways Crisis Services Supervisor; Undersheriff Daniel Willey; Deputy Ryan Luezzo; Sheriff Greg Zyburt; Johnny DePetro, Marquette County Commissioner; Tony Retaskie, Marquette County Ambassador; Randy Larson, Marquette County Ambassador; Gerry Corkin, Marquette County Board Chair, Diane Heidtman, Marquette County Prosecutors Office; Erik Powers, LSCP Business Development Representative. Located on 221 W. Washington St. in downtown Marquette, U.P. Supply Co. offers a variety of local retail products and an environment for creatives to aid in the advocacy of the Upper Peninsula. The store is open from 10 a.m. – 6 p.m. and can be reached at 906-273-2848 or www.upsupply.co. Pictured from left: Pete Frazier, Marquette City Commission, Mary VanTilburg, LSCP Business Development Specialist, Christian Palomaki, River Valley Bank, Paul Hess, Upper Peninsula Supply Co., Bugsy Sailor, Upper Peninsula Supply Co., Fred Stonehouse, Marquette City Commission, John Marshall, Marquette County Ambassador and Jenna Smith, Marquette City Commission.